Scientists at the Department of Energy's SLAC National Accelerator Laboratory have made the first structural observations of liquid water at temperatures down to minus 51 degrees Fahrenheit, within an elusive "no-man's land" where water's strange properties are super-amplified. The research, made possible by SLAC's Linac Coherent Light Source (LCLS) X-ray laser and reported June 18 in Nature, opens a new window for exploring liquid water in these exotic conditions, and promises to improve our understanding of its unique properties at the more natural temperatures and states that are relevant to global ocean currents, climate and biology. 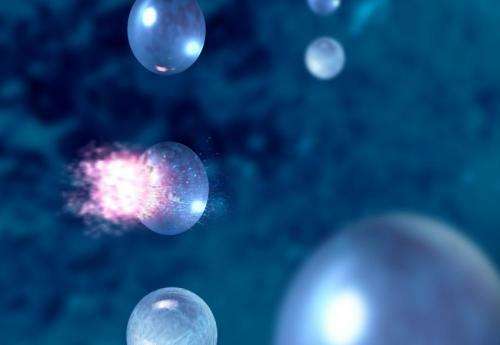 Scientists have known for some time that water can remain liquid at extremely cold temperatures, but they've never before been able to examine its molecular structure in this zone. "Water is not only essential for life as we know it, but it also has very strange properties compared to most other liquids," said Anders Nilsson, deputy director of the SUNCAT Center for Interface Science and Catalysis, a joint SLAC/Stanford institute, and leader of the research. "Now, thanks to LCLS, we have finally been able to enter this cold zone that should provide new information about the unique nature of water." These traits are amplified when purified water is supercooled. When water is very pure, with nothing to seed the formation of ice crystals, it can remain liquid at much lower temperatures than normal. 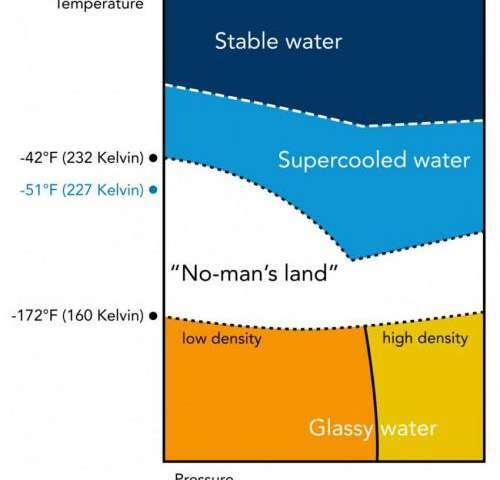 The temperature range of water from about minus 42 to minus 172 degrees has been dubbed no-man's land. 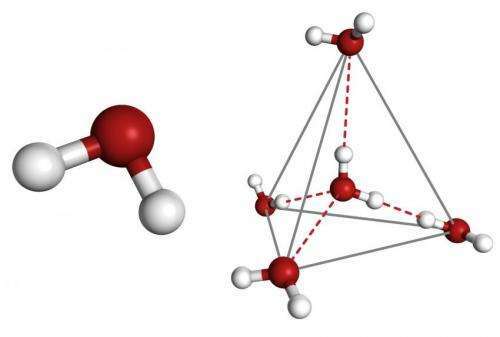 For decades scientists have sought to better explore what happens to water molecules at temperatures below minus 42 degrees, but they had to rely largely on theory and modeling. Now the LCLS, with X-ray laser pulses just quadrillionths of a second long, allows researchers to capture rapid-fire snapshots showing the detailed molecular structure of water in this mysterious zone the instant before it freezes. The research showed that water's molecular structure transforms continuously as it enters this realm, and with further cooling the structural changes accelerate more dramatically than theoretical models had predicted. Nilsson's team hopes to dive to even colder temperatures where water morphs into a glassy, non-crystalline solid. They also want to determine whether supercooled water reaches a critical point where its unusual properties peak, and to pinpoint the temperature at which this occurs. "Our dream is to follow these dynamics as far as we can," Nilsson said. "Eventually our understanding of what's happening here in no-man's land will help us fundamentally understand water in all conditions." I would love to know if this experiment would have any different outcomes, if the Mpemba effect were taken into account (where warmer water freezes faster than colder water). yes, and what did they actually find? article didn't say... thats like saying 'we landed on the moon!'. Ok, and? Could you stop wit the obsolete temperature scale, if anyone uses Fahrenheit they aren't interested in this kind of thing, they're teabaggers. Scientific measures should really be in Kelvin or Celsius though. @quantumDelta- Why? Idk, I'm old school. I learned using Fahrenheit so that's what I am comfortable with.